Delve into the SkillHUBS world by checking out our publications. 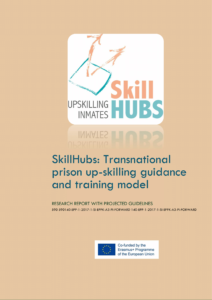 The Research Report is a comprehensive document which aims at identifying existing good practices, skill gaps, mismatches and related policies in EU in the field of skills assessment as well as at analysing, accessing and benchmarking the existing practices of inmates up-skilling in EU prison systems. The document opens with a presentation of the state of art of prison education in Europe while it proceeds by focusing on the situation in the partner countries (Slovenia, Malta, Romania, UK and Belgium). The results of the qualitative, quantitative and desk research conducted in the countries of the partnerships are being presented and analysed and based on them an insightful set of recommendation is being provided to the reader. The document is available in EN.